As more pet pawrents around the globe see the connection between their pet’s health and the quality of food they buy for pets, dog food companies are responding. A few smaller pet food manufacturers are rising above the big players to produce innovative, nutritious pet foods made with human-grade ingredients. Tell us, what high quality foods make your dogs drool? No matter what country you live in, we want to know about your dog’s favorite commercial foods, so please comment below or contact Tripawds with your own food review! 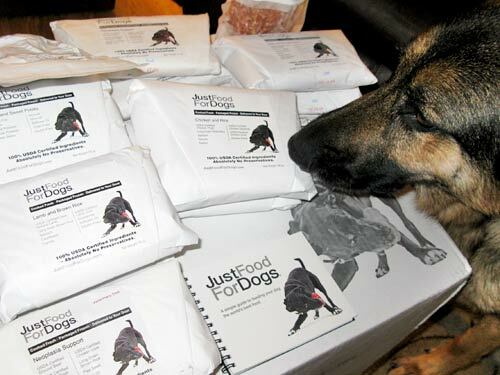 Here in the U.S. a new company called Just Food For Dogs is earning accolades from vets and canine nutritionists for delivering outstanding frozen homemade meals straight to customers’ doorsteps. Their recipes are so good, we want to make sure U.S. pawrents know they can try this excellent new alternative to home cooked dog food. Just Food For Dogs (JFFD) produces small batches of home cooked, flash-frozen meals made with 100% USDA certified meats, vegetables and whole grains. Tripawds Spokesdog Wyatt Ray went nuts when he received a care package straight from JFFD’s custom-designed dog food preparation kitchen in Newport Beach, California. Since January 2011 JFFD has created six different recipes of human-grade, preservative-free meals. What makes JFFD stand out from other dehydrated and frozen raw meals currently on the market is that is that each individually vacuum sealed package of food is made in small batches and cooked to minimal levels to maximize the nutritional value. Visit the JFFD website to see exactly what goes into each meal. Just Food For Dogs even offers a line of outstanding homemade and customized veterinary prescription diets that help dogs live healthier lives when combating specific diseases like cancer, kidney and liver disease and obesity. We’re really excited about JFFD’s Neoplasia Support Meal, which we’ll tell you about in an upcoming post. For dogs with special nutrition needs that aren’t currently on JFFD’s menu, for $95 their veterinary nutritionists will work with your vet to create a customized meal plan just for your dog’s specific nutritional needs (meal costs are additional). JFFD’s recipe formulations are based on National Research Council (NRC) recommendations to ensure all essential nutrients are present. 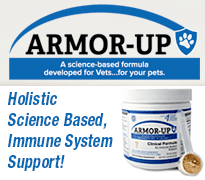 Each meal contains individually-formulated nutrients from NHK Laboratories, a respected U.S. Manufacturer. And unlike home cooked meals that you might make at home, each package of JFFD can be fed as a stand-alone diet without added supplements. Tripawds Spokesdog Wyatt Ray and his friends the Oaktown Pack had a great time feasting on JFFD’s delectible meals! With not so much as a single upset stomach, these pups were begging for more at the end of each meal. 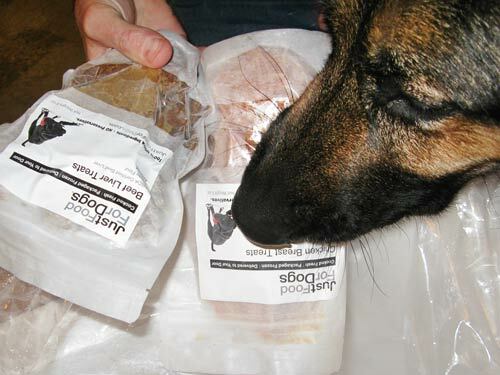 JFFD also creates several different supplements for joint care and probiotics as well as seven different types of fresh treats including everything from beef liver to frozen pupsicles. 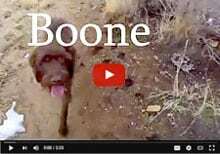 Their website features an extensive unbiased education center that shares the fundamentals of canine nutrition that’s worth checking out. When you receive your first Just Food For Dogs package you’ll get lots of great materials including a recipe guide to help transition your dog to home cooking with a reduced risk of gastrointestinal upset. JFFD also provides you with measuring scoops, a food container and even a surprise toy for your pooch. 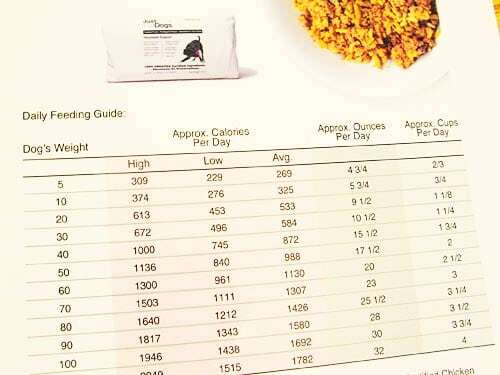 The materials also include ingredients lists and fact sheets that show you the cost differences between JFFD’s extraordinary meals and popular holistic-oriented commercial dog foods. For now, Just Food For Dogs is only available in the U.S. by visiting their storefront, ordering on the phone or online. Orders are shipped almost everywhere in the U.S. via overnight courier. Remember to share your dog’s favorite prepared foods with us! Comment below or contact Tripawds with your own food review! 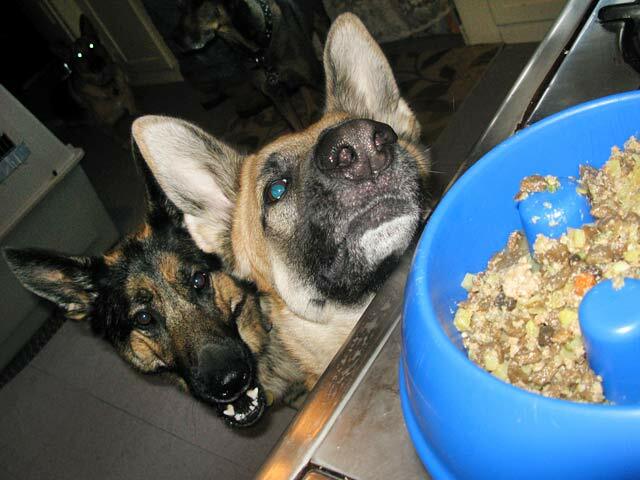 A big three paws up to Just Food For Dogs for creating the healthiest foods for our canine heroes! Stay tuned for a review of Just Food For Dogs Neoplasia Cancer Support Home Cooked meal. Hi Tami, I’m pretty sure that there is not but I will ask the company and let you know here. Stay tuned. How very timely! JFFD is right down the road from us, I pass by their store all the time. They came to our clinic a few weeks ago to make a presentation to the veterinarians about their product (unfortunately, I was not able to attend). We decided we were going to stop by there later today, and now I see this blog post! We are also lucky enough to live about 15 minutes away from JFFD! The food is highly endorsed by Linda & Bernie! In fact, they just finished a batch of lamb and rice just last week! We love JFFD, and JFFD loves dogs!! Oh what a coincidence! Maximutt & Wookie, we are so impressed with their food. It looks remarkably like what we have cooked for our dogs in the past, only it’s clear that it tastes 1,000 times better! You guys are so lucky you live so close. We are within their shipping distance but unfortunately Wyatt would need his own RV fridge to keep all this goodness stored! Tami, to answer your question, the JFFD people have just reassured me there are no GMOs, growth hormones or other unnatural ingredients in their foods. Ooooo, thank you, Jerry! 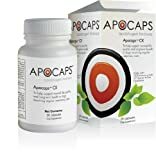 We are definitely outside the delivery area being in Illinois, but with this news, I am going to check this out further and share the site with my friends. Hey Tracy let me know what you find out. This food is INCREDIBLE! We are very impressed with what Wyatt got to try. I believe they ship FedEx & UPS, which goes anywhere, even Northern Maine right? Yup, frozen. That’s bizarre! Why won’t couriers ship frozen there? My dog is allergic to peas and barley and beef. Do you have a preparation that she could eat? Thanks for asking Linda, but we don’t make the food. Please consider contacting Just Food For Dogs directly, or searching this blog and the Eating Healthy discussion forums for other options.